Censored Broforce Sprites and "Game-ready"
Some time ago I've uploaded sprites, shared at Wikimedia Commons (https://commons.wikimedia.org/wiki/Category:Broforce) and got official confirmation they were actually released as CC-BY-SA (i.e. they are free). But admin has deleted them with the reason given "These are not game-ready." So what is the reason for such obvious cherry-picking? Can somebody provide the precise definition of "game-ready"? Or maybe you people have something against Broforce's developers and their artwork? This example is not representative of the 'most art' on OGA. Most authors do make a attempt to provide images in a format that can be used in games. Although image dimensions and other technical details are not standartised, users can at least expect sprites to be on a transparent or solid-colour background. >This example is not representative of the 'most art' on OGA. >Most authors do make a attempt to provide images in a format that can be used in games. OGA has a lot of concept art, which can't be used in game. Or art like http://opengameart.org/content/4-characters which would require some time to cut sprites out. So deleting art because of some technical details would be an example of despotism? >users can at least expect sprites to be on a transparent or solid-colour background. unfortunately your argument is invalid. Regarding "vaguety". Wikipedia admins explicitly ask about CC-BY-SA license, when people commit their artworks. So if Broforce devs indeed commited these artworks themselves (as is the case), they explicitly agreed to the license. They could have decied on "fair use" license instead. Maybe a better solution is to recategorise the submission under "Concept Art", which - even though it clearly isn't concept art, it's screenshots from a completed game - at least means the art is not meant to be game ready. Then you should resubmit the game ready ones separately, or better yet extract useful content from the rest. I remember you submitted the whole lot, including the ones that are clearly screenshots and not game ready. So deletion has little to do with screenshots or sprite sheets. This leads me to conclusion that admins dislike Broforce and don't want any attribution to it, even if they provide a few free sprites. This is odd. The assets look very good to me, and the subject matter isn't controversial. If we were removing non game-ready assets in earnest we wouldn't start with nice pro assets like these. I'll try to see what happened. Honeslty i have no idea why they were removed, there is no reason they should have been that i can see initially. Do you have a link to the page I can check and restore them. I suppose its also possible there was a server issue or something. 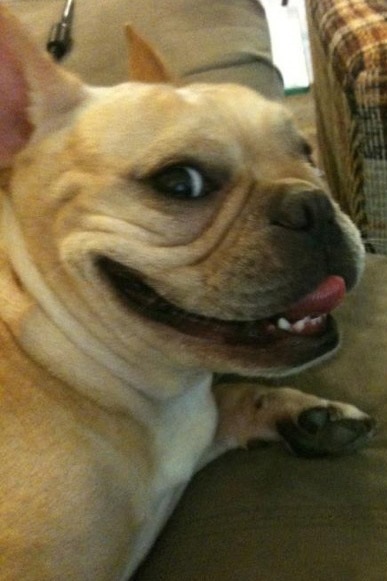 >Do you have a link to the page I can check and restore them. Notice: Trying to get property of non-object in _forum_access_comment_access_callback() (line 114 of/var/www/sites/opengameart/sites/all/modules/forum_access/forum_access.module). The requested page "/comment/38462" could not be found. Indeed, I’ve overlooked that some sprites are quite usable. I removed it under these grounds. If Bro-force wanted to release their sprites to be reused in another game, they would have released sprite sheets under that license. These are screenshots for Wikipedia, and Wikipedia requires images with a free license. Scraping Wikipedia screenshots for reusable art is technically legal, and ethically awful behavior. Regardless of chosen license, if the original owner/artist has not intended for her art to be used in other games, it shouldn't be on OpenGameArt. Contact BroForce and see if they want their sprites to be reused in other games under CC-BY-SA. If the answer is yes, then we'll upload their original sprite sheets with all parties on the same page. Side note, I didn't realize that deleting an upload also removed attached comments, possibly before the comment reply emails are sent out. I'll start adding at least a couple days between when I "Flag Licensing Issue" and "Delete" a submission. I never want an artist to come to OpenGameArt, see their own work, and become upset -- because they didn't intend to share their art to be reused in other games. I don't want OpenGameArt to be despised because we're scraping Wikipedia articles for people to use in competing projects. Or worse, we never want any OpenGameArt users sued for making a game that uses art from another game. Even if the license says Okay, ask before uploading if you're Not Sure. If it's obvious the artist wants their art to be shared and reused in this way (in other game projects), then you probably don't have to ask. Wikipedia is definitely on the opposite end. Assume people there have NOT shared art with the intention of being used in competing games. In the BroForce response from FB posted above, that's not confirmation they allow their art on OGA. They are sharing skepticism that anyone could build a whole game with just those parts. That's not consent from the original artist. Consent should be obvious and enthusiastic. "Yes! Please share my art on OGA." We're a friendly and responsible community here. Even if something is technically "legal" to post on OpenGameArt, we will (and SHOULD) remove it if it will stir up controversy. And scraping art from screenshots of existing commercial games is dubious, at best! OpenGameArt is NOT a place where we hoard game art at any cost. We want to make a trusted repository of art where game developers can be safe knowing they won't get accused of stealing other people's work. Basically, there should be no danger in having a consumer say "Hey, these guys ripped off BroForce!" >Scraping Wikipedia screenshots for reusable art is technically legal, and ethically awful behavior. Not every person is ethical - some are lawful. You remind me of Russia and Russians, who believe that feels and morals are above laws. I.e. you annex Crimea and start war in Ukraine, because you think it is ethical and moral to do so, even if technically illegal. We call that "воровской закон" - "prison mentality" or "prison ethics"
>Regardless of chosen license, if the original owner/artist has not intended for her art to be used in other games, it shouldn't be on OpenGameArt. >Contact BroForce and see if they want their sprites to be reused in other games under CC-BY-SA. If the answer is yes, then we'll upload their original sprite sheets with all parties on the same page.CC-BY-SA implies that the answer is "yes". Learn some first-order logic, instead of guessing and hair splitting. If you can't understand that this site aims to be both Ethical and Legal, then you are welcome to never submit art here again. >Even if the license says Okay, ask before uploading if you're Not Sure. If it's obvious the artist wants their art to be shared and reused in this way (in other game projects), then you probably don't have to ask. Wikipedia is definitely on the opposite end. Assume people there have NOT shared art with the intention of being used in competing games. Same applies to any CC-BY-SA content, not just Wikimedia Commons. The authors of GPL game could be against forking or using their artwork, or even code (as was the case with Daimonin). I'm pretty sure authors of Wesnoth wont be happy with someobody forking it and selling for Android, because they sell it themselves. To be coherent with your logic, you'll have to also delete most of my submissions and other people submissions, because most submitter haven't asked original authors, judging that CC-BY or GPL means it is okay to reuse. Your "ethics" are for some reason directed against me. You don't force other submitters to re-ask original authors. The whole reason for Creative Commons is to avoid wasting time asking and increase availability. You appear to be against Creative Commons. You continue to submit art that is on the boundaries of what's allowed. When you contacted BroForce you were well aware that they did not intend for their art to be reused in competing games. This will not be the first board you've been banned from for starting trouble. A quick google search shows the issues you caused in /prog/. Do you want to be a contributor to this community, or a source of arguments? >You continue to submit art that is on the boundaries of what's allowed. If it is CC-BY-SA it is CC-BY-SA. There is no "boundaries". But if you dislike my submissions, I will remove them and resubmit to some other site. So these submissions would be free from your politics. >When you contacted BroForce you were well aware that they did not intend for their art to be reused in competing games. When I contacted BroForce, we got confirmation that they indeed licensed it as CC-BY-SA, which allows unconditional reuse. Other stuff are just your guesses. >This will not be the first board you've been banned from for starting trouble. >A quick google search shows the issues you caused in /prog/. /prog/ is an anonymous board, somebody probably posed as me. I wasbt banned here, just haven't visited it for some time. You appear to be building your reasoning and taking your arguments from anonymous imageboards. This characterises you well. >Do you want to be a contributor to this community, or a source of arguments? I don't want anymore. Because it is not a free community and has a lot of subtle rules and ethics, above law and commons sense. > feels and morals are above laws. Ethics are not above laws on OGA. OGA doesn’t break any laws by not accepting some of the submissions. Admins of OGA have full right to choose what they would accept. OGA is under no legal obligation to run this site in any particular way; they are absolutely free to sell this site to Microsoft tomorrow, no law prevents them from doing so. So, no one broke any laws by not accepting your submission, and your comparison with vorovskoj zakon is not really useful. No laws are broken. > other submitters to re-ask original authors. Because you’re probably the first person to start searching for freely-licensed assets on such a large scale. Which, in itself, is a noble endeavour, but it would be nicer to make sure authors don’t mind. > time asking and increase availability. The purpose of OGA is not the same as the purpose of Creative Commons. OGA uses some CC licenses as a tool, but it doesn’t determine the purpose of OGA. >Not every person is ethical - some are lawful. You remind me of Russia and Russians, who believe that feels and morals are above laws. I.e. you annex Crimea and start war in Ukraine, because you think it is ethical and moral to do so, even if technically illegal. We call that "воровской закон" - "prison mentality" or "prison ethics"
What do the russians think of man + young girl? Do they feel ok with that? From elsewhere in the globe Russians following of their feelings is refreshing and gives a smile. It feels similar to the old southern way of doing things. How would you feel about people using your open-licensed models in a libre-video game of 3d fighting? A competing game, if you will. However there is a rub: a main contributor to that game hates feminists, and is pro-marry-girl-children, and often cites Deuteronomy 22 28-29 in the original hebrew. People have deleted this contributors work before for that, and try to cencor the project because he is a contributor. Many in opensource feel that opensource ends where their belief in women's rights and opposition to old ideas such as men marrying girl children, begins: progressive pro-women, anti-male-supremacist (man is ba'al, _Master_, of the woman in the old testament, supremacist) politics are more important than libre software. Said team will never, ever, obey requests for censorship or removal of assets that were properly licensed regardless of law suit threats or of knives to their knecks. Accusations of improper licensing will be ignored aswell. The team is meticulous in making sure licensing is proper at the outset and will ignore change of heart of authors or accusers. They would prefer to fight and die than to give one inch. They know there is really nothing for them in life, so who cares. chaosesqueteam: I understand how my art might be used when I upload my own art to OpenGameArt. It's ok for people to use my art in games I don't agree with. Compare to this situation: did BroForce understand their art might be used in competing games when they upload screenshots to Wikipedia? Part of all of this is us working on upated rules for submitting art. When submitting art that isn't your own, assume NOTHING. Always ask, make sure they want their art on OpenGameArt. I may ask Bart if the default user can be configured to only allow uploads of their own works. Then, we could have a level of approved users that are able to also submit art created by others. These would be people that know about licenses and our policies on getting permission from artists. Have to agree with Clint here. It's quite obvious that the Broforce developers don't want their art used in other games, so don't. And don't upload everything to OGA you find on the web, I've already previously shown you that those Advance Wars sprites were recolors and stolen art from Nintendo. Clint: Thank you for explaining your reasoning. Next time, please do something like flagging with a licensing issue and mentioning your reasons more directly to avoid this kind of confusion. (We'd also love to have you on the IRC again, and it would have made this a bit smoother too). I think we could always ask the team directly. They did after all choose to upload them as clean, unblurred screenshots including some isolated assets. Naturally we will honor their wishes either way but I think there's a chance that they wouldn't mind. Nikita: we've had this conversation before, including the cynical and practical side which should satisfy you if the ethical side doesn't. I don't think we need to have that conversation again. >Compare to this situation: did BroForce understand their art might be used in competing games when they upload screenshots to Wikipedia? They have released art under CC-BY-SA, just like you do, unless you somehow got superior understanding to other people. The conversation was about unclear license and that OGA removes content, when authors request it. In Broforce case, license is clear as day and accepted at OGA (it is CC-BY-SA, not BSD or MIT), while authors haven't requested take down, and don't appear to care even about somebody making a complete clone. OGA is on the web too. Does that mean, that stuff taken from OGA and modified cannot be uploaded back to OGA, even if CC-BY-SA's -SA clause demands it? >I've already previously shown you that those Advance Wars sprites were recolors and stolen art from Nintendo. The Advance Wars case was a clear copyright infringement on the part of artist who did recolors at DeviantArt. Well, I think Clint made it clear, that me and my contributions have no place at OGA. So I ask them to be removed. Best luck and happy coding, everybody! Screenshots are an interesting issue - the licence and copyright status of screenshots of games tends to be unclear, and I can see a developer might release their screenshots under a free licence without realising the consequences. OTOH, what is the point of free licences, if we fear it's unethical to do what the person has told us we can do? There are not "Free licences" and "Free licences for things that can be used in games". In this case it's probably a Good Thing to ask to make sure they understand the implications, but I don't think anything is unethical by doing what has been permitted, and plenty of Free art/music may be useful in things other than what the original authors may have had in mind (incorrect licensing OTOH - including by the authors themselves - I would argue is unethical). Note that it's not true that Wikipedia requires images with a free license - there are many exceptions, including Fair Use (e.g., https://en.wikipedia.org/wiki/File:Hellenicphalanx.JPG ). Also there may be other reasons for not releasing sprite sheets, e.g., it takes extra effort for them to release assets separately, or also, they may have decided that extracting from screenshots is of far lesser value that they don't really care (so I can crop a few still graphics from those screenshots, great - it's a far cry from the full animated set of sprites). It's not like one can recreate the game or anything near it with some screenshots. Judging by their FB response, it seems they don't consider the screenshots to be of significant value for creating other games. I don't think anything is obvious. Regarding the debate on whether asking people in advance of uploading if you're not the author should be recommended or required, some related threads are http://opengameart.org/comment/37964 and http://opengameart.org/comment/38365 . There is also the question of how "own works" applies to derivative works (e.g., if I create a 3D model using a Free texture from elsewhere). I don't think trying to claim what is ethical or unethical is helpful though. Admins should do what they think is best for the site (whether that's doing things on a case by case basis - "we should get explicit permission for this one" - or making a change to the FAQ or rules). i.e. BSD/MIT licensed assets and scavenges from Wikimedia Commons. I can't see what is even remotely controversial about removing this submission. Ask yourself, is this the kind of work OGA should be hosting? Is this useful to the OGA community? Is this the sort of thing OGA wants to be known for? Ripped sprites and playing legal 'gotcha' with developers? And that's assuming the sprites were ripped, which they were not even. Again, it's just screenshots and promo art from a commercial game. Heck, two of the screens were the game logo and the developer's logo. Whom does it serve to host that on OGA? Even if they were properly ripped and reformated (which again, they were not! ), do you want OGA to be known as the place people go to get those hot BroForce sprite rips? It takes years to build the trust and reputation OpenGameArt.org has, submissions like this can shatter that in a heartbeat. I'm guessing you could easily muster a 'If you want to go through our promo shots and rip all the sprites and tiles, more power to you!' from the devs (afterall, what else are they going to say at this point? and I'll point out again that is not even what the submission was!) but I'm with Clint, the standard you should be looking for here is an enthusiastic, 'Yes, please take our sprites, we want to share our work with the creative commons, build on it and be fruitful!' And honestly, it should come from the devs themselves, submitting their own work, as properly formatted sprite sheets. That's the kind of submission that grows the community and builds trust in OGA as a place to go for high quality free and open art, not this third-party submitted 'technically it's legal so you can't stop me' stuff. >OGA as a place to go for high quality free and open art, not this third-party submitted 'technically it's legal so you can't stop me' stuff. Well, I'm a technical person (a programmer by heart), and for us, programmers, it is either yes or no - true or false. We can't be bothered with political and public relation side of things. Futermore people at OGA have long pointed me that it is unethical to scavenge sf.net repositories, because artists and programmers could be against that. Sincerely I've grown tired of that girlish "people have feelings" nonsense I've to hear since childhood, so I'll just leave OGA, because I clearly have incompatible worldview with OGA's policies. Given your stance about "girlish 'people have feelings' nonsense", I trust you won't take it personally when I disable your account access to OpenGameArt. Thanks for trying to participate, and good luck on your new collection. I sent this message to Free Lives (the BROFORCE developers) on Facebook. 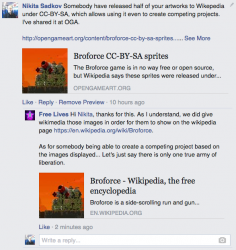 Someone recently contacted you on FB saying your Wikipedia screenshots were uploaded to OpenGameArt. I'm a moderator for OpenGameArt -- even if art is CC licensed, it our policy to only offer for download art that the creators INTEND to be reused in other games. I made a moderator decision that scraping Wikipedia articles for "Free" game art is unethical and not what OpenGameArt is about. I have removed his submission of BROFORCE material from our site. If you are ever interested in sharing your art specifically for use in other games, do let us know. But I'm going to assume that Wikipedia is not an acceptable place for our users to plunder art. I guess I qualify as a programmer (certainly not an artist), so let me say here that I would like to disassociate myself from this mindset. You don't have to be a sociopath to be a programmer. I don't know if I would say it's unethical to use assets which a company freely chose to release under an open license. To me this is more a question of courtesy, which is a somewhat higher standard. It is the best policy for OGA to be courteous and I wholeheartedly support it. But I wouldnt necessarily say someone would be in the wrong to use these assets. I really do believe that licensing matters and should be regarded as such, whether we host them or not. It's too bad whenever a contributor chooses to leave. Nikita, occasional issues and differences aside, we do appreciate the time you have taken to track down freely licensed assets and bring them to the site. I wish you the best of luck in your future endeavors. Redshrike I agree with you on that point about ethics and courtesy. I think it's okay for e.g. a beginner making a game to go through Wikipedia for art to use, and that doesn't have to be unethical. That even seems in the spirit of Wikipedia as a learning/knowledge resource. It's different for us as a community site, where we're offering art guaranteed to have no commercial restrictions. I don't know, in this case, I have a hard time seeing it as anything but unethical. The work was so clearly intended as promotional material, for me personally, I just can't see ripping sprites or tiles out of there and not feeling like I was stealing regardless of how they were licensed. And I do think there's a place for saying that no matter how the work was licensed or distibuted you should still be respectful of the original artists intentions and/or wishes. I guess it's parsing english, but I'd put that somewhere above courtesy. Courtesy is holding the door open for someone, or in this realm, notifying someone when you use their work. It's a good thing to do, but it doesn't make you a bad person if you mess it up or forget to do it sometimes. Ripping someone's work when it was so obviously only intended for promotional use, I think that crosses a different line entirely. Alright, I'll get off the soapbox now, but not without adding that Nikita himself posted the work with the comment that the original artists would probably be mad if anyone used it in their project, which I think speaks volumes as to whether it was an acceptable submission or not. @hectavex: Actually, that slowly escalated over the course of about 3 months and 3 weeks. I think the community can honestly say we did the best we could to make space for Nikita here, but in the end he summed it up best, his worldview is just not compatible with OGA's mission and policies. The good news is that the internet is a big place, hopefully he'll find somewhere where his contributions are a better fit. @Clint Bellanger: I think the message to Free Lives was a good idea and well worded. I'm sure you don't need me to tell you this, but you did a good job explaining the situation and making the site's policy clear. @capbros: New here, didn't know the history. By escalated quickly I meant my comment was deleted the next day I checked for it. That was an important comment dude! I'm kidding. Sounds like the admins cut him enough slack and did all they could though. I had this twitter conversation with one of the BroForce creators. He said they would not have minded, but agreed it seemed unethical. I clarified that we aim to host art that is definitely, enthusiastically intended to be reused in games. @Clint Bellanger: Great follow up! Actually, he confirms that they did not really want the work out there as CC-SA-3.0. It just goes to show that just as someone can accidentally or unintentionally violate a license, someone can also accidentally or unintentionally choose a license. Let's not be a place that holds people to their mistakes when that happens. @hectavex: no worries, I just didn't want anyone to think they play lightly with the ban-hammer around here. ps: i like the new avatar pic! every time I see someone get their account banned or deleted I hear in my head this chiptune from an old game I cant place the name of. Comes down to following: They say they implecitely agree with uploading it here which means it is ethical and which means it surely can be posted here. They agree even if they dont endorse it. Let me follow up your idea would mean we could not simply take stuff from wikimedia / wikipedia without asking the author if he would say thankyou for uploading it here.Which in turn means i would need to delete the alien smeily set and the anime heads too? If that is the essence i think the idea definitively goes much too far. 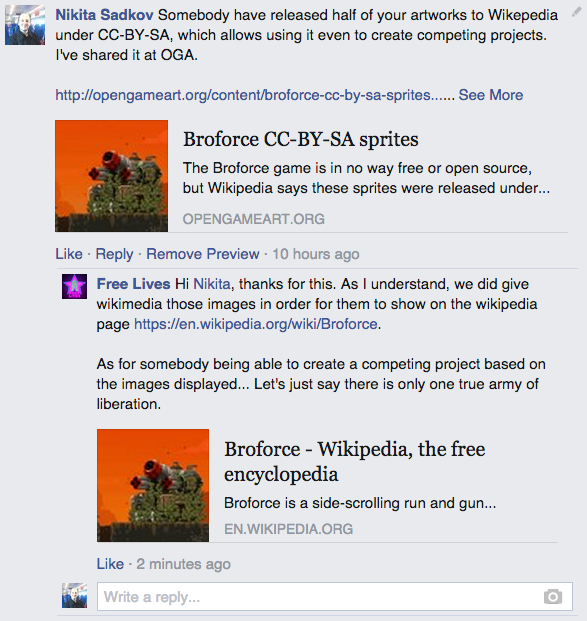 Facebook response from Basil (of BROFORCE team), reposted here with permission. Thanks so much for this! I did reply to his message which was (in a way) warning me about a few screenshots being on OpenGameArt. I wasn't altogether worried, as anyone could get the same quality, and newer, screenshots from youtube videos or anywhere else. Clint what was your message i dont get the context. Rainbow Design: I added links between the two comments so that my message and their response are easier to find. Thankyou i see now to what the response is.
" I wasn't altogether worried" So also he sais he does not care at all since its not really high quality. Which again i think confirms the point that its far fetched to call it unethical. From Ruan Rothmann on Twitter, one of the Broforce team. is probably legal? but certainly not ethical. in our case particularly, we won't care. Obviously our screenshots and such shouldn't be under CCBYSA 3 then, not sure which license to use then? Here you can see one of the Broforce devs agree that scraping screenshots for reusable content is "certainly not ethical". And wondering if the license they chose is not the one they intended. Situations like this is why it's always good to ask before uploading art that is not your own. We hold our collection to a higher standard than simply "trust what the license says". I have been flexible in the past with art that is definitely marked as Public Domain or CC0. I think people who choose those licenses are more aware that their art can be used in any manner possible. But asking is nice, and may help invite another artist to join our community.